Please use spoiler tags if you want to post results in this thread! The Ro8 is finally upon us with the final two groups being played out this past week. It would not be an understatement to say that we've had one of the biggest upsets this ASL. 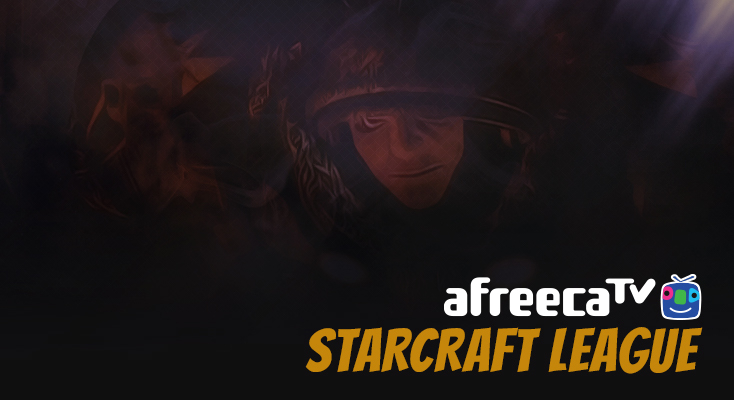 Group C which featured Mong against three protosses saw Mong dominate the competition advancing in first place while Best, ASL2 semifinalists finished in second place. Group D is where the upsets took place. sSak who many considered would likely end up being eliminated in last place took first place in the group beating both Jaedong and Last! Jaedong after beating hero in quite the thriller faced off against Last in his worst matchup, TvZ. Despite playing stellar early on, Jaedong could not deliver the finishing blow allowing Last to take the game and advance in second place. Two TBLS members down already. This leaves only Bisu and Flash left in the running for the championship with some great opposition! The Ro8 groups were drawn right after group D concluded. The first two series for this week are sSak vs Bisu and Mong vs Shine. sSak vs Bisu promises to be interesting as both players were teammates on SKT T1 during the KeSPA era while Mong vs Shine could go either way depending on map order among other things. The other two series that will be played next week are Soulkey vs Best and Flash vs Last. More on these two series in a later writeup. As you sit back and relax while waiting for the games to start in , feel free to browse our writeup below. The Ro16 group C and D were recapped by EsportsJohn while the Ro8 group A and B were previewed by BLinD-RawR and BigFan respectively. Finally, we brought in a special contributor who wrote a battle report for the Jaedong vs Last game of group D, eonzerg! Let's get hyped for more BW! Surrounded by a plethora of Protoss players including perhaps the best PvTer right now, Best, Mong kept his cool and again came out on top in the group with a quick 2-0. In the opening match against Best, Mong opened with a well executed Fake Double which quickly closed out the game against his opponent's risky triple nexus build. Mong again opened with a marine/tank pressure against GuemChi on Camelot, and again the Protoss seemed completely unprepared for it. While GuemChi held on for dear life, Mong was able to easily deflect his harassment and close in on the feeble Protoss forces. Normally, Best is a god at PvT, and his PvP is nothing to scoff at either, but his performance last week was anything but solid. Despite full knowledge of Mong’s build on Andromeda, he reacted with a build order loss. He redeemed himself a bit against Jaehoon and GuemChi, but it was still a bumpy road for the normally dominant Protoss player. IamFail and Failhoon came out to play. Despite having some moments of brilliance in the Ro24, GuemChi and Jaehoon just couldn’t get the ball rolling last week. Jaehoon took a fast triple nexus on Andromeda and got torn apart by GuemChi’s reaver harass. In turn, GuemChi chanced a proxy 2-gate in the worst possible location on Circuit Breaker in the final match against Best. While they did have some good moments, it wasn’t enough to make up for the glaring weaknesses in their play. Bet you regret picking sSak for your group now, Jaedong. Hmm? Simply put, sSak’s performance in this season of ASL has been remarkable. While he doesn’t possess the raw mechanics of Jaedong or Last, he was able to outsmart his opponents with clever and decisive play. Against Jaedong, sSak went for an unusual build on Andromeda by taking three fast bases and teching straight to valkyries and vultures. Jaedong got his third base up completely uncontested, but sSak just kept building up the valkyrie count while continually boobytrapping Jaedong’s fourth base with spider mines and establishing a mech infrastructure. When sSak came knocking on Jaedong's front door with a simply 1-1 tank timing, Jaedong had nothing to answer it and quickly met an untimely end. On Camelot, sSak went toe to toe with perhaps the best TvT player in the world. sSak and Last went for differing builds, but without any apparent pressure on the map, the game settled into a rather passive stance with small attacks being parried on both sides. But then Last made a bold play to push forward into sSak’s third with a smaller tank count, and instead of trying to push Last back, sSak immediately went for the counterattack into Last’s completely open natural. The game went topsy-turvy in a sort of pseudo base race as both players attempted to push out a quick fleet of wraiths to clean up the tanks, but sSak’s defense was good and he managed to clean up Last’s forces while saving both bases and almost all of his SCVs. Jaedong and Last were without a doubt the players to beat in this group, and if not for sSak’s insane performance, both Jaedong and Last would have definitely made it out of the group. The Jaedong vs Last game on Circuit Breaker was epic and heart-wrenching, and—it needs to be said—the better player won. There’s too much to sum up here. Just go watch the game and read the Live Report thread. Despite being ranked the fifth best player in April, hero didn’t do well last week. In his first match against Last on Andromeda, hero crumpled under the pressure of a single proxy barracks in the center of the map. His ZvZ against Jaedong was much better—and worth watching—but he was simply outplayed by the master himself. Both players opted for a macro game; 12 hatch with Jaedong opting for the recent economy heavy variation, 13 pool while Last like a true machine opted for a 13 CC putting himself in the best position he could be. Now, you have to understand that by Last doing 13 CC, he is able to play aggressive and tech up at the same time without any risk. His economical choice is like a mineral hack. Jaedong was tested early on with an early timing push of 10 marines 2 medics 2 firebats. At the time the force hit, there were only 2 sunkens ready and 2 more morphing. Last was able to kill one and forced Jaedong, who was already on the edge of the game, to make more lings and pull some drones to defend. One of the sunkens completed morphing so Last retreated. Now here is the thing, Jaedong defended this attack. He killed some marines, but... Lets talk about timings. Jaedong was forced to pull out drones (gas included) and was forced to make lings. This means that Jaedong is not able to produce the usual 9 mutalisks, aka there is not a single way to punish the economy of the terran after that commitment. Behind this, Last is on an untouched economy, playing 3 barracks with fast tech factory starport with a particular variation to his gameplay. To put this into perspective, Last's factory was done when Jaedong's den hasn't even started yet. This is going well so Last since he hit the right timing and it paid off for him. Meanwhile, Jaedong tried to find some holes in Last's defense and killed 1 scv, some marines and 1 medic in the terran main. Behind this, Jaedong made a hydra den and a queens nest and took a third. Everything was very standard, but with delayed timings. Now this is the part of Last's play that took me totally off guard. Instead of the classic 3-4 siege tank push 1 vessel play, he opted for factory mine/speed vultures. Jaedong at the same time rushed for defiler tech with no upgrades and a not so healthy economy. He was able to keep sniping more marines at Last's front. Last wasn't specially interested in making a strong timing push attack. His biggest plan was to gain map control with vultures and bio presence with vessels to deny mutalisks, lings or lurks around the map in order to establish the human mass expansion. Jaedong took his third almost without trouble. He just lost 2 drones in a transfer to 2 vultures. This meant that Jaedong's third (a very delayed one) wasn't full saturated and his future fourth was full of mines. Behind this, Jaedong tried to clean mines with some lings and he sniped 2 siege tanks with mutalisks. Last attempted to attack Jaedong's fourth with 4 tanks and some vultures, but Jaedong cleaned it up so fast that you probably missed it. Now, with Jaedong gaining momentum for the first time, he also cleaned the rest of the bio and recovered map control somehow. He made a brilliant move to attack the mineral only expansion of Last and brought 4 scourges along. At least, that was what I thought. It was everything going according to the plan. Last lifted the CC to avoid the lings, but then the scourges ran away. 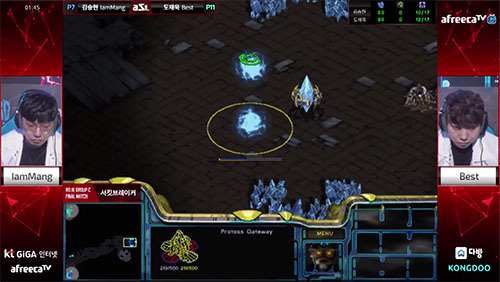 Jaedong took a fifth base and also tried to take a mineral only expansion, but was unable to due to a lone spider mine. Jaedong started to push out with 4-2 upgrades vs 1-2 terran and he cleaned up a big siege tank line in the center. After losing most of his ultralisks, with a less expensive drop containing 1 lurk 1 defiler 1 ultra and the rest of his army, he took down the rest of the tanks that were defending Last's second main base. Last was able to defend though and with the lack of zerg forces, he re-established the bases again. Jaedong then tried a new attempt to drop Last's mineral only in the top right while Last pushed Jaedong's forth. 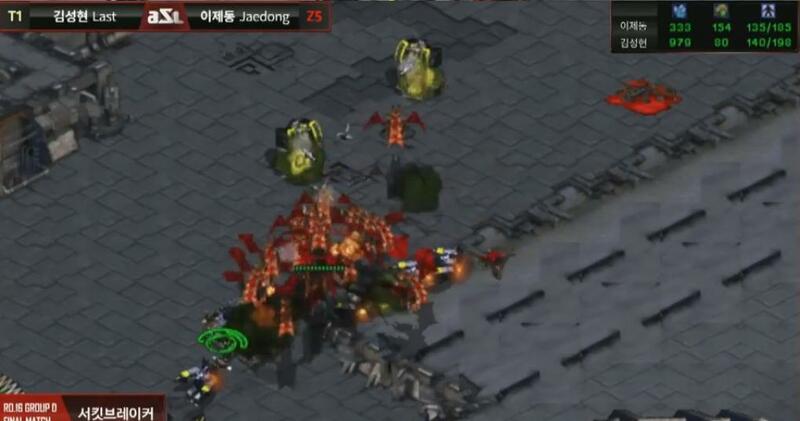 Magically, Jaedong anticipated this move and made a swarm of mutalisks to defend. Sadly, Last's vultures killed most of Jaedong's drones at his fourth base after cleaning the tanks and vultures. 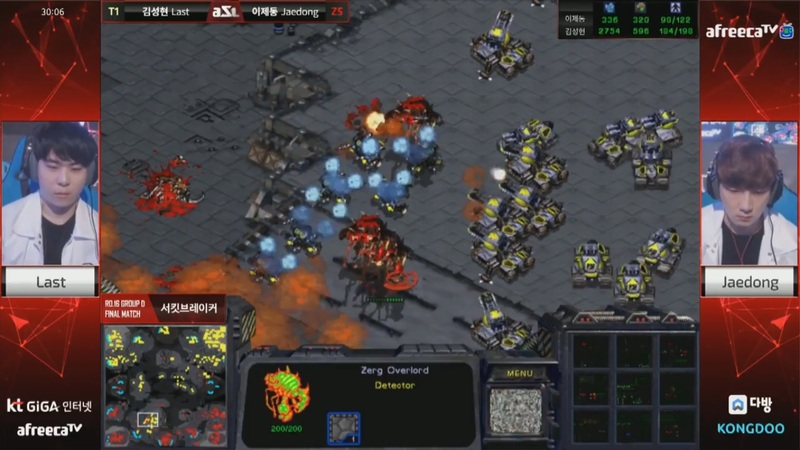 Jaedong took the mutalisks, which were only 0-1 carapace upgrade, and tried to take down Last's secondary main. While Jaedong tried to kill the siege tanks, all the mutalisks were killed in the process by 2-2-3 goliaths and turrets. For a moment, it looked like there was hope, but the zerg just didn't have enough resources to keep sending units non-stop to clean that base once and for all. Vultures and mines started to become stronger than ever in every explosion by then. Jaedong's attempt to hurt Last's economy didn't pay off and the terran with one final push ended the game on the cliff of anger. On the one side, we have a refocused revolutionist Bisu. On the other side, we have the deadly force sSak. The unfortunate twist here is, should sSak lose, he is mostly likely going to enlist in the army, as his enlistment date is 15/5/2017. Literally, the day after this match. sSak’s current run in the ASL can be summed up as surprisingly great and depending on who you’re cheering for (and by that, I mean if you’re a Jaedong fan) completely infuriating. His latest result is another 2-0, winning a hard group by beating Jaedong and Last. That said, his TvP has been pretty untested in recent days. He showed some good game sense in his game against Rain in the Ro24 by punishing Rain’s greedy expansion into carriers and his game against free in the SSL Classic isn’t anything to write home about either. This is a hard battle against Bisu that really doesn’t matter to him due to his unfortunate circumstances. All he can really hope for is to show his best game for the fans and walk out with his head held high. Bisu is reaching legend status again, topping April with an overall win rate of 100-28 (78.7%) across all 3 match-ups. His PvT alone constitutes 40 of those wins and after surviving the group of death in the Ro16, his series against sSak will be much more like the calm before the storm considering his possible opponents in the other match-ups. It is good that it is a Bo5 series so, we get to see why Bisu’s PvT is so good. The maps for the series favor Bisu for sure. Outsider, the repeat map has been protoss favored in pro-scene history. The cliff next to the natural is a great place for a tank drop but, on the other hand, it's also a great place for Bisu to do storm drops. I’d expect to see a lot of shuttle vs drop play supplemented by arbiters in the later game from Bisu. Andromeda also causes problem for the terran mech to expand and take bases, especially getting that third gas can be a pain. While the island is always going to be a good choice, it's not carrier or recall proof unless it's filled to the brim with turrets. Camelot and Circuit Breaker are definitely better maps for sSak and he will probably look towards splitting the map in Camelot while the classic 2/1 timing works best on Circuit Breaker, but game 5 once again will play out on Outsider. Bisu to advance, 3-0 to the semifinals! During the KeSPA era, Mong was a B-teamer on CJ Entus and only ever made a single appearance in PL, losing a lone game to Really. When he joined the scene in early 2012, he started to make his mark, winning first place in the second SSL he participated in. As the level of competition went up during the Sonic era, so did Mong's skills with him reaching the Ro8 and eventually finishing third place in SSL9 and 10 respectively. Known as Pig Terran for eating on stream and at one point, advertising chips, Mong became a staple player in the various competitions displaying very solid TvZ and TvP while his TvT was not as strong as the aforementioned matchups. With the end of the Sonic era, Mong had a dip in his level and was eliminated earlier in competitions, losing to many different players. However, he slowly made his way back, taking first place and two second places in several offline competitions towards the end of 2015/beginning of 2016 after defeating opponents such as Last and EffOrt. His foray into ASL was less notable though with him crashing out in the early group stages in both the first two seasons. His game against Jaedong in ASL2 where he lost on Eye of the Storm was more a testament to the Tyrant's skills rather than his own failings. This ASL, Mong has only faced off against a single zerg, Soulkey on the terran favoured map, Camelot. There was not much to take from the game aside from the fact that Mong needs to be a bit more patient at times because it could come back to haunt him. His TvZ sits at 58% and doesn't include any recent results aside from what was mentioned prior. Up against him is Shine, who has recently returned to the BW scene. Unlike Mong, Shine was an A-teamer back during the KeSPA era on Samsung Khan and has even gotten quite close to the grand finals stage back in EVER 2009 OSL where he took third place. There is also little doubt that Shine is a quicker learner considering that he is the ASL observer and that will be extremely beneficial for him going forward. As things stand, Mong has the advantage in their series. Despite his TvZ not being as solid as it once were, TvZ is slightly favoured towards terrans due to the 5 rax +1 into mech build that has been on display for months now and has been haunting zergs everywhere. However, if Shine is able to utilize his mutalisks effectively and get his third and fourth gas at their usual timings, he has a chance to strike and try to break Mong before he fully fortifies his bases. The other option is for him to come up with map-specific strategies such as the ones he came up with on NEC and Camelot to throw Mong off his game. Playing on a stage in front of an audience in a high stakes match is nerve-wrecking as is and losing the first game in a BO series can be crushing to the confidence of some players. Also, let's keep in mind the fact that Mong is neither Flash nor Last. This does not diminish his skills in any way since those two players have been shown to be extremely solid in the TvZ matchup beating the best of the best (or losing to Larva repeatedly recently) on any given day. Maps will play a crucial role here if Shine wishes to best Mong and advance to the semifinals where there is a chance for him to meet Bisu, his old rival from years past. You could even say that if Shine wins, he's guaranteed a path to the finals through hydra busts. The four maps for the Ro8 are Camelot, Outsider, Circuit Breaker and Andromeda. Circuit Breaker has been shown to be decent for TvZ and both Andromeda and Outsider are considered zerg maps. The mineral-only base on Andromeda as well as the map size and island bases can be extremely beneficial for Shine if he wishes to utilize a similar strategy to what EffOrt did against Sea in the Ro16. Outsider also has the two side mineral bases which can help with providing minerals for cracklings in the late game. Camelot is going to be the troublesome map for Shine due to the short distances and ability for the terran to grab four gases while being able to defend them well so I expect that he'll drop this map unless he comes up with a unique strategy. Though I would love to see Mong advance and have repeatedly cheered for him since the SSL days (except against Jaedong), I'm going to vote with my heart and say that Shine will take this series, 3-2 primarily due to the aforementioned reasons and the more favourable map pool. Mong will put up a hell of a challenge though and make sure that Shine has to work for the win, thus the series will be extremely close. Shine to advance to the semifinals! Wait what? what does it mean that sSak's enlistment date is 15/5/2017. What does this mean if he wins I mean? Can he delay the enlistment date? If sSak loses here gonna miss this terran. He was really consistent through all these post KeSPa days, during Sonic era and Afreeca tournaments. Even won 1 championship. Does anyone happen to know what time it's being broadcasted PST/KST? thank you eon for the battle report! that game was really nice to watch. after jaedong's forces spilled into lasts bases i thought for sure jaedong is going to win. I couldn't believe how well Last delt with it and how he assumed control. Thank you so much for the battle report. Reading it brings back memories from the old days. Especially loved the reference of Shine's hydra busts that he used to always do against Bisu. Broke my heart that day watching Bisu drop out of the tournament due to that cheese/all-in from Shine. I am worried about match 2. Mong is too strong. If Shine doesn't beat Mong, we won't be able to see Shine destroy Bisu. Although, seeing Mong destroy Bisu is the next best thing. Match 4 is extremely worrying. God's chances of winning against AlphaGo is very slim. If you're not Flash, you're Last!